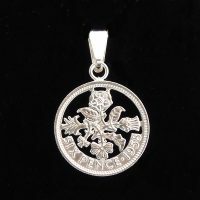 Sixpence coin pendant necklace available by birth year from 1953 to 1967. The Sixpence has been cut by hand to highlight the National emblems Of England, Scotland, Ireland and Wales. You can buy it in the following years: 1953, 1954, 1955, 1956, 1957, 1958, 1959, 1960, 1961, 1962, 1963, 1964, 1965, 1966 and 1967. Minted 1953-1967. 1959 is a 60th birthday or anniversary..